The Southern African Rotarians are banding together to create a distribution system for the region. The Minister of Education for Namibia has designated 80 public schools to be provided material by Rotary for their classes. If the pilot goes well then Rotary will be providing educational materials to all 380 schools in the country. The Rotary Clubs in Lesotho, Swaziland, Zimbabwe, Zambia, and Malawi are all using commercial trucks which are delivering products to the markets in Johannesburg to transport books back to their countries on their return trip. In the local communities, our Southern African Rotarians are strategically connected to the literacy needs. 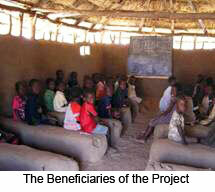 Their connections insure the delivery of the materials directly into the hands of the needy. This capability is unique to Rotary, for the quality of the Rotarians and their influence in the community makes the difference. Our challenge now is to replicate this successful system in other parts of Africa and the world. To replicate this system, the basic ingredients are committed Rotarians and volunteers, donated warehousing and transportation, and a supply of donated books and educational materials. Each potential site will need a site inspection and project evaluation before an attempted implementation. However, literacy is the only way out of poverty and extreme poverty must be eliminated for the world to find peace in our time.